Jerome's Vinny DiLucca drives the ball during the Jerome High School Invitational Monday at Jerome Country Club. See story on Page B2 and more photos at Magicvalley.com. Kimberly's Drake Baumann chips onto the green during the Jerome High School Invitational Monday at Jerome Country Club. 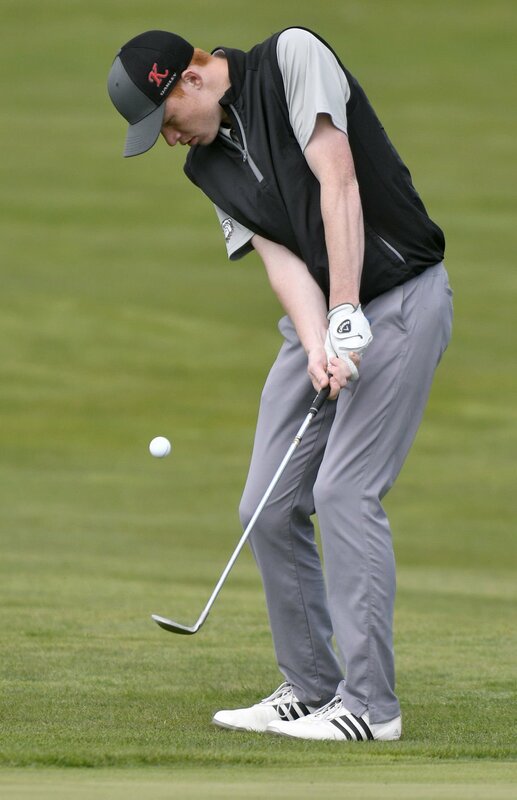 JEROME — Twin Falls High School boys and girls teams finished on top at Monday's Jerome High School Invitational golf tournament sponsored by Subway. In the boys division held at Jerome Country Club, the Bruins edged out Minico by two strokes. Ridge Pickup of Burley carded the top score with a 71, followed by Joey Gibson of Minico with a 72. Braden Anderson was third with 74. In the girls tourney at Canyon Springs Golf Course, Twin Falls took the top spot by a 17-stroke margin with a 358. Canyon Ridge had 375 and Minico 411. Dallis Shockey of Minico shot the best score with an 82, Brinlee Stotts of Twin Falls ended with 83, just ahead of Canyon Ridge's Kelbie Standley of Canyon Ridge with an 84. Buhl's AJ Armitage putts during the Jerome High School Invitational Monday, April 15, 2019, at Jerome Country Club. Bishop Kelly's Carson Curtis chips onto the green during the Jerome High School Invitational Monday, April 15, 2019, at Jerome Country Club. Nampa's Ryan Grove chips onto the green during the Jerome High School Invitational Monday, April 15, 2019, at Jerome Country Club. Middleton's Devon LaPrath putts during the Jerome High School Invitational Monday, April 15, 2019, at Jerome Country Club. Filer's Landon Dey putts during the Jerome High School Invitational Monday, April 15, 2019, at Jerome Country Club. Century's Bryce Shipley hits onto the green during the Jerome High School Invitational Monday, April 15, 2019, at Jerome Country Club. Burley's Ridge Pickup tees-off during the Jerome High School Invitational Monday, April 15, 2019, at Jerome Country Club. Middleton's Devon LaPrath chips on during the Jerome High School Invitational Monday, April 15, 2019, at Jerome Country Club.